Chili or capsicum pepper (Capsicum minimum, Capsicum annuum, and Capsicum frutescens) is a familiar herb or semi-shrubby plant in almost every garden throughout the Tropics and even in temperate climates. Capsicum minimum, or bird pepper, attains a height of 2 or 3 feet. The leaves are thin and narrowly lanceolate and the white flowers are about 1/4 inch in diameter. The fruit is of an orange or scarlet color, oblong in shape, and 1/2 to 3/4 inch in length. This plant is extensively cultivated in East Indies, Zanzibar, Japan, and various other tropical countries. It is the source of most of the cayenne pepper of commerce. 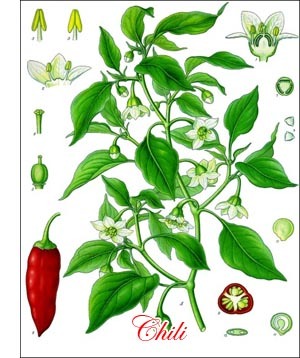 Capsicum annuum is taller and bears larger leaves and pods, 3 inches in length. This pepper is commonly called capsicum or pod pepper and is extensively cultivated in California and the Southern States. If grown as annuals, the crop is harvested in about 8 months. In the Tropics the plants may be allowed to stand for 3 years or more. It is propagated by seed and planted at distances which allow from 6,000 to 10,000 plants per acre. The ordinary yield of dried chilies per acre varies from 1,000 to 1,500 pounds annually. The bird pepper pods are thoroughly dried in the sun and then in an oven, after which the pods are beaten to a powder. In the further preparation of the material about 15 times as much flour is added to the beaten pepper powder and the mixture is then baked and later ground to make the common red or cayenne pepper of the trade. Capsicum peppers are used as a spice in curry, in Hungarian paprika, in tabasco sauce, as red or cayenne pepper, as feed for cage birds and domestic fowls, and in medicine. In India it appears that chilies do best on sandy loam and alluvial soils or on upland soils containing an abundance of lime. The crop is always affected favorably by a previous crop of legumes. Chilies may be allowed to grow for many years as ornamental plants or for household use. Poultry raisers quite commonly have a few of these plants in chicken yards. Most domestic fowls appear to be fond of the peppers.